In our report on Startup Funding we found that bootstrapping was the preferred funding model among the early stage startups. We spoke to a range of early stage startups who had all registered a company or sale trader business within the last 18 months. 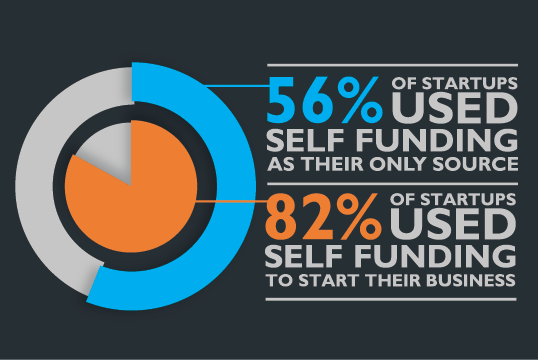 56% of these startups were using their own money to entirely fund their business while 82% were using self-funding as a significant part of their funding mix. Much of the press around startups and encouraging entrepreneurship in recent years has focussed on the availability of finance. Our research suggests that this may not be a major concern for many new businesses. Since the financial crash of 2008 it has become more difficult for many entrepreneurs to obtain funding from the banks. In response, many alternative finance solutions have sprung up, such as crowdfunding and peer-to-peer lending. Moreover, the government has increased its’ efforts to encourage entrepreneurship, by introducing schemes such as Startup Loans. So while traditional funding sources have dried up others have sprung up in their place. Unfortunately there has not yet been much research on how this changing funding landscape has impacted on new startup businesses. What research does exist focuses mainly on entrepreneur’s use of bank loans and government grants. Almost none looks at alternative finance (such as crowdfunding and peer-to-peer lending) or the government’s Startup Loans scheme. For our 2016 Startup Funding report we asked early stage UK startups about the funding sources they had used, including alternative funding sources, and also asked them what advice they would give to other entrepreneurs about funding. What we found was that the most commonly used funding source for the new startup n our survey was their own money with 76.7% using self-funding and a further 5.4% using their bank overdraft. ‘An individual is said to be boot strapping when he or she attempts to found and build a company from personal finances or from the operating revenues of the new company’. Try your best to fund it yourself and only apply for funding when you need to. Be patient and persistent. The key is to be able to self fund. Plan well ahead so as to cut down how much you think you need to borrow, there are always viable and legal ways of setting up things for free for your business. Like initial free websites, A Facebook page etc. Also if you don’t know something, simply ask someone who does, never be afraid to ask for help or advice from others, as knowledge is power. In these responses, and others, the importance of controlling costs and self-funding where possible came through clearly. These entrepreneurs were not self-funding out of a lack of available alternatives but because they did not want to borrow. Nearly all of the debate about startup funding is on how easy it is for startups to obtain external money. Our report suggests that this may be the wrong focus. Instead more effort needs to be put into working with startups on budgeting, cost control and the principles of bootstrapping a business. At The Company Warehouse, we’re aware of how vital it is that startups have access to low-cost services to get their business up and running. As well as offering free company formations, free business email and free telephone based business consultancy we have a range of low cost services. These start with company formation and business registration, and we also help startups to access our specialist support staff who cover areas including accountancy, marketing, web design and branding.